They went onward from Denver on Sunday 28th July to Long Beach (California) a few miles south of Los Angeles, taking part in USAAF Air Force Day celebrations in Los Angeles on the 1st August. – 15 of the Squadron Aircraft left Lowry Field at 09.36 am en route for Long Beach, Los Angeles, California arriving at 15.00pm precisely. The Rockies were crossed via the Albuquerque Pass which enabled the Flight to be made without Oxygen for Ground Crew Passengers and give superb views of the Rockies & the Grand Canyon. This Flight was long, hot & bumpy. Three members of the Squadron were airsick. Many Tropical Storms were dodged en route. The Weather was good at Long Beach but the haze of the Pacific reduced visibility to about 1.5 miles. Thus it was felt that the Lead Navigators had to put up particularly good effort to arrive once again at the appointed time. During a Lecture Tour in the US Frank Whittle after a stressful life and being addicted to benzedrine had a nervous breakdown and retired from the RAF on Medical Grounds on 26 August 1948, leaving with the Rank of Air Commodore. Other notable Guests included British/Hollywood Screen Actors led by Sir C Aubrey Smith, who had just flown in from Los Angeles in a tiny Aircraft flown by his niece – the 2nd Flight of his Life, Herbert Marshall, Merle Oberon, Mary Pickford, Olivia de Havilland, Alan Mowbray, Peggy Cummings, Boris Karloff, Gracie Fields, Nigel Bruce, Richard Greene, & Peter Lawford. It was here that RAF Fighter Ace Alan Geoffrey Page announced his engagement to Pauline Bruce daughter of British Actor Nigel Bruce (of Dr Watson fame) who in 1934, he moved to Hollywood, later setting up home at 701 North Alpine Drive, Beverly Hills. Many Actors & Studios made Open House and entertained the Aircrews at Beverley Hills. Flight Lieutenant Stockwell arrived from Mitchel Field, NYC in Lancaster TL-R having followed the Commander in Chief Sir Norman Bottomley’s route as ‘Back-up Aircraft’ from Mitchel Field via Dayton & Kelly Field, San Antonio, Texas. Long Beach Field, Los Angeles, F/L Bullen, F/L Gardner, F/L Hulbert, F/L Simpson, F/L Lewis plus a couple of friends. The biggest Crowds were round the Avro Lancasters & York Aircraft. Long Beach Army Airfield (4 miles North of the actual Beach) became the Home of the Army’s Air Transport Command‘s 6th Ferrying Division, which included a Squadron of 18 Women (WASP Squadron Operations) Pilots Commanded by Barbara London, a long time Long Beach Aviatrix. The Army’s Ferrying Work was an immense undertaking, thanks to Douglas Aircraft’s Wartime Production. The Ground was broken for the initial Douglas Aircraft Facility in November 1940, with dedication in October 1941. 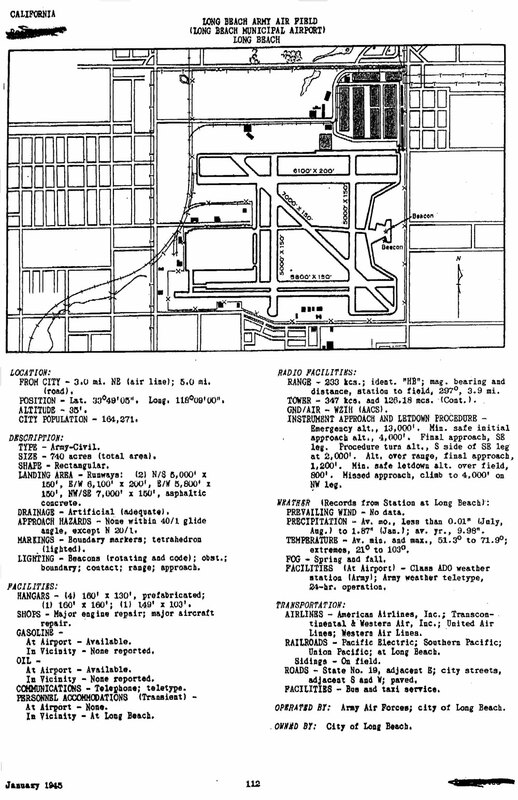 Douglas had been drawn to Long Beach’s growing Municipal Airport with its Army & Navy Facilities. With Wartime Contracts, the Company went into intensive Production. The Company’s 1st C-47 was delivered 16 days after the Attack on Pearl Harbour and another 4,238 were produced during the War. The Plant turned out some 1,000 A-20 Havocs, not to mention 3,000 B-17 Flying Fortresses & 1,156 A-26 Invaders. They observed a US Navy High-Speed Launch carrying 2 Radio Controlled Target ‘Drones‘ at taking a good look at 50yds Range and the Howard Hawkes Flying Boat ‘Spruce Goose‘ seen in Dry Dock at Long Beach. Dredging Operations were in progress to clear its passage to the Sea, there was much speculation and not a little cynicism in the USAAF circles as to whether this Amphibian would Fly successfully. IWM Reel 1 Detail: San Francisco – Military Base during an Open Day – various US Aircraft on Display – Overflight by 12 Lancasters in Formation. Constellation, B-17 C-47, C-54 on the Apron. US Army Recruiting Service bus, CBS info desk, shot of Lancaster (TW657) and Avro York (TW892). Shot of Staff Cars & Senior Foreign Officers being greeted by US officers. RAF Air Chief Marshal in the Shot (Guy Garrod). Foreign Officers viewing white painted Lancasters. Street views of Chinatown, Officers ‘window shopping’. View of Golden Gate Bridge & Local Bay Area. Driving over Golden Gate Bridge. A C Marshall Bottomley of RAF arrives by Aircraft, walkabout RAF Station then departs in Dakota (KG782). B-17 overflying Lake, servicemen swimming, shot of Log Cabin & Crews sitting around a Camp Fire. Officers throwing rocks into the Lake (Merrit?). A scene of Outdoor Swimming Pool, couples posing for a Photographer, general messing about. B-29 (521785) taxiing, Lancasters lining up for Take-off. Air to air shots of Lancasters in Formation Flying over New York City(?). Shot of Lancasters on the Apron (ramp) & Aircrews on Parade and taking part in March Pasts. Marshalling taxiing Lancaster & VIP speeches. Reel 2: Aircrew arriving at Aircraft (TL-H, TW878 F/O Timothy Lamb) and Taxi out. VIP visitors looking around Lancaster with 6th Ferrying Group of Long Beach, Sign on background building. Female Celebrity (Dorothy Lamour) signing Lancaster SW313, TL-B – F/O Barker and posing in front of B-29 “City of Spokane”. RAF Officers on a Sightseeing Trip, scenes at Barbecue. Lancasters in Formation air to air over Baltimore (Baltimore Brick Co. sign on Factory Roof). Flying over US Capitol Buildings, Washington, Crews on Parade in front of Aircraft. View of Senate House & White House, back to Aircrew & Groundcrews being inspected by RAF/ USAAF Officers & VIPs. Picnic scene with Crew eating & posing. Avro York being Serviced with C-47 & Lancasters on Apron. B-25 taxiing. Visitors (US Officers & Spouses) strolling around Aircraft on Display. Engine Service on Lancaster. Interior Shots of Officers Club. Shots of City Skyline & elevated view over Central Park, New York & Surrounding Streets. As the main event was to be present as part of the USAAF Air Force Day display with Open Day’s at Long Beach Field, March Field, San Bernadino and Victoriaville. The theme was ‘Air Power is Peace Power‘ and 12 Lancaster Aircraft took off at 30 sec intervals to take part in a Formation Flight over Los Angeles, Pomono, Rose Bowl Arena, Lomita, Long Beach, Santa Monica, and Oliver City which took 1½ hrs. Take off was at 10.07 am and arrival back at base 14.08 pm The intermediate ETA’s which were given for some of the points on the route were all exactly satisfied by the Actual Time of Arrival. The flying conditions were very very smooth although the thick haze up to 2000 ft almost constituted low cloud at parts of the route. They flew in formation over the Good Samaritan’s Hospital dipping their Wings in honour of Aviator Howard Hughes who was then recovering from his near-fatal Crash in a Maiden Flight of his Prototype XF-11 on 7th July 1946. That night there was a 7.30pm Reception at the Hollywood Roosevelt Hotel in the California Room to mark the USAAF 39th Anniversary. Lt Gen George E Stratemeyer was the guest speaker, Sir Guy Garrod &, Air Marshal Sir Norman Bottomley with Group Capt Collard & W/C A J L Craig were also in attendance having received Western Union Telegram Invitations. They visited the Douglas Aircraft Works at Long Beach, and travelled to Catalina Island 22 Miles SW of Los Angeles (sailing on the “Snafu Maru”?) or was it the SS Catalina. Scenic view of Catalina Airport on Santa Catalina Island. Four planes are parked on a small runway, with three men, each standing by a sea-plane. One man points to writing on the plane which reads, “Wilmington-Catalina Airline, Ltd.” This unique airport at Hamilton Cove, the 2nd cove north of Avalon. This airport was designed to accommodate the Douglas Dolphin amphibian planes carried 10 Passengers. The twin-engine Dolphins landed just offshore and would taxi up a ramp to a large turntable mechanism. 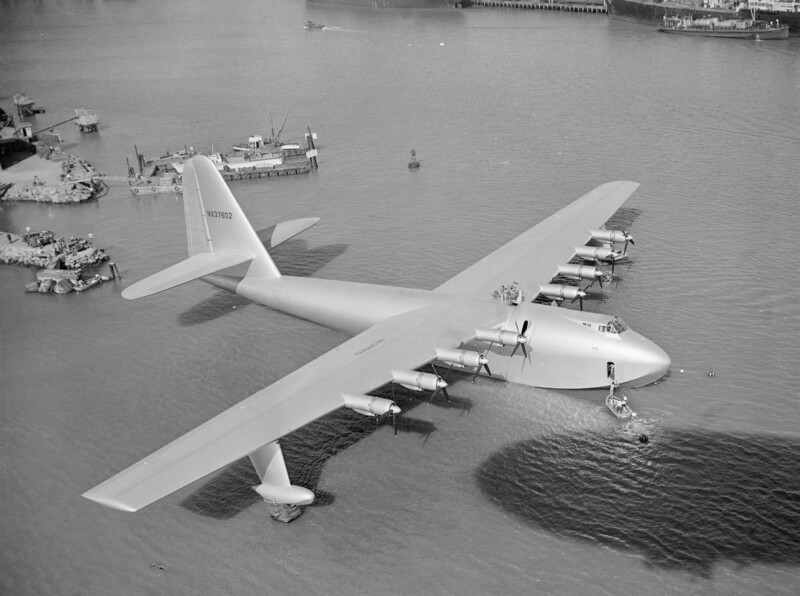 The aeroplane would then be rotated until it was facing the water and ready for a trip back to the mainland. Note the small Spanish-style terminal building. Catalina’s 2nd Airport in the Sky opened on 27th June 1946. As the main event was to be present as part of the USAAF Air Force Day display with Open Day’s at Long Beach Field, March Field, San Bernadino and Victoriaville. The theme was ‘Air Power is Peace Power‘ and 12 Lancaster Aircraft took off at 30-sec intervals to take part in a Formation Flight over Los Angeles, Pomono, Rose Bowl Arena, Lomita, Long Beach, Santa Monica, & Oliver City which took 1½ hrs. Take off was at 10.07am and arrival back at base 14.08pm The intermediate ETA’s which were given for some of the points on the route were all exactly satisfied by the Actual Time of Arrival. The Flying conditions were very very smooth although the thick haze up to 2000ft almost constituted low cloud at parts of the route. They flew in Formation over the Good Samaritan’s Hospital dipping their Wings in Honour of Aviator Howard Hughes who was then recovering from his near-fatal crash in a maiden flight of his Prototype XF-11 on 7th July 1946. That night there was a 7.30pm reception at the Hollywood Roosevelt Hotel in the California Room to mark the US Air Force 39th Anniversary. Lt Gen George E Stratemeyer was Guest Speaker, Sir Guy Garrod & Air Marshal Sir Norman Bottomley with Group Capt Collard and W/C Craig were also in attendance, having received Western Union Telegram Invitations. At 17.00 pm all officers were the guests of the then 72-year-old Mr Arthur Atwater Kent (Largest US Radio Manufacturer and Millionaire) who gave a colossal Party at his Estate in Bel Air in Beverley Hills. Kent himself had closed his Business an immediately headed for California, bought a palatial Estate in the Bel Air section of Los Angeles and proceeded to enjoy the fruits of his many years of highly profitable enterprise. He acquired a Mansion named Capo di Monte atop the highest hill in Los Angeles. This Estate was well-known as a venue for lavish Parties, attended by numerous Hollywood Luminaries. The Party was known as a Circus Party the Guests were greeted by the famous Italian Organ Grinder & his monkey who were often seen on the Silver Screen. Clowns showed the way to the Party in the Garden which was displayed as for a Circus with a Circus Band, Clowns, an Elephant, a Camel, Performing Dogs, and a Performing Horse. These various animals later all performed at a Cabaret. There was dancing and of course unlimited supplies of food & drinks. A very large section of the ‘Acting’ Community’ were there and as can be imagined a very lavish and happy evening was spent by the Officers present. Unfortunately owing to the early departure the following morning Personnel had to leave at 21.00pm. Capo di Monte is now the site of the Bel Air Hotel. The NCO’s and Airmen were entertained at a farewell party at the NCO Club. The week-long stay at Long Beach had been truly memorable. (In the Spring of 1949 Atwater Kent became hospitalised with a virus infection & passed away at the age of 75). For more than 90 years, the corner of 18th & Grand has been dominated by the massive Grand Olympic Auditorium. Architect Gilbert Stanley Underwood designed the Space as a Boxing Arena & Convention Centre, but one that could also accommodate Opera & Ballet and Roller Derby’s. More than 15,000 cheering Patrons packed the Opening Night Bout on 5th August 1925. The Hall hosted Boxing, Wrestling, & Weightlifting competitions of the 1932 Olympic Games and thrived as a Sports venue with deep roots in the Spanish-speaking Community of Los Angeles into the 1980s. 15 Aircraft led by the Squadron Commander Craig left Long Beach at 07.45am en route for Kelly Field Nr San Antonio. The route was via Indio, Blythe, Gila Beno, Tuscon & El Paso on the Mexican Border to San Antonio, Texas over the Arizona & New Mexico Deserts and was remembered as very hot and uncomfortable.